The following changes have been made to RockWorks16 since the previous update (1/21/2015). The RockPlot2D polyline clipping no longer creates false lines. The Symbol Legend is no longer corrupted within the ReportWorks program when the properties dialog is selected. 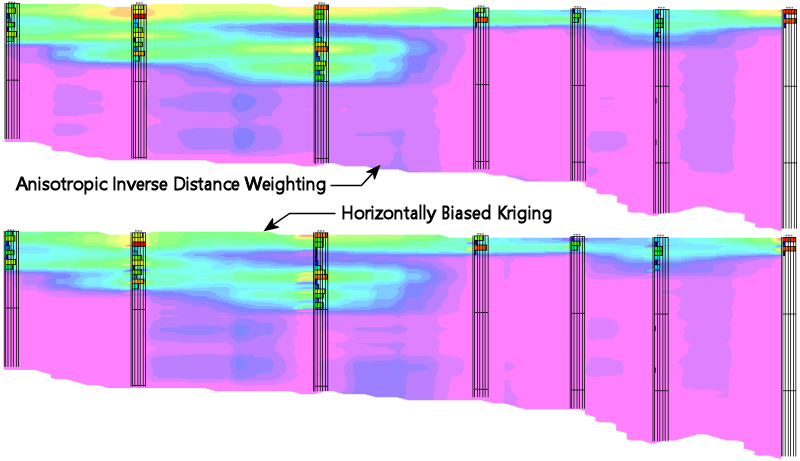 The borehole axis polyline is now properly clipped when plotting 3-D boreholes. 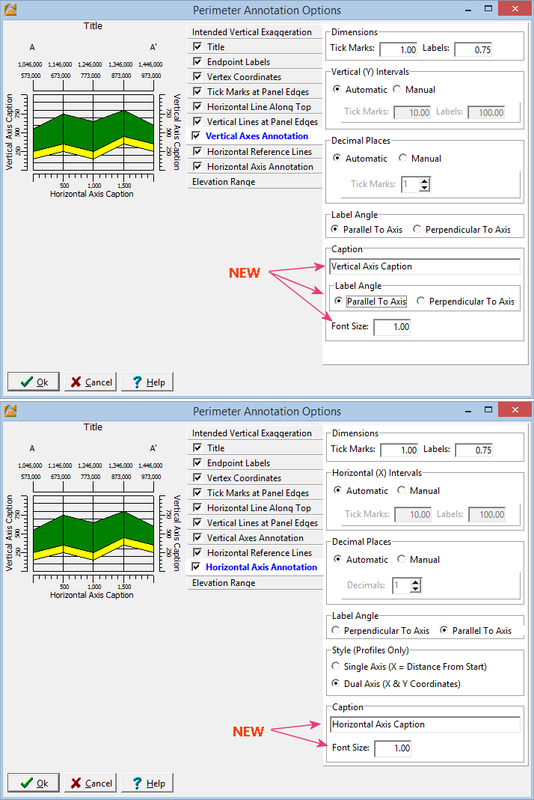 (058) Improvement (03/02/15/MIW): Stratigraphic panels with zero-length are no longer added to the Fence Panel Selector menu. The Utilities / Volumetrics / Block Model now reports the proper total volume when showing grade statistics by level. The AGS import is now more forgiving of errors and variations in the AGS formatted files. If the Units line is missing a value or the line is missing entirely, the import will compensate. It will also allow more variation in what it accepts as comma-separated-values. When setting up the import from the template it will make sure it is using the correct block of data. The errorlog will now record errors incurred during the import. The dialog that appears when an unexpected error occurs has been redesigned. A new button labeled “Search Support Forum” provides a means to search for more information about the specific error. 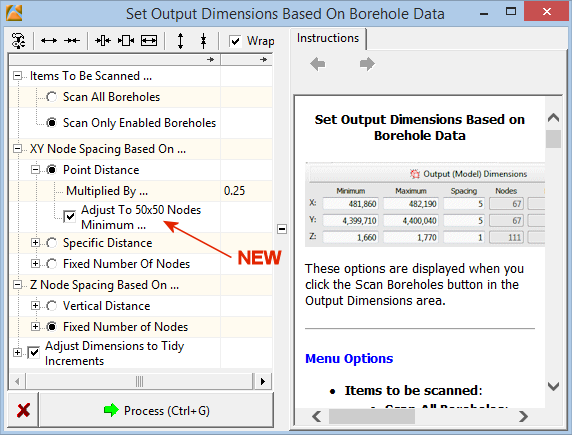 A new option titled “Adjust To 50×50 Nodes Minimum” has been added to the Output Dimension computation menu. This option (enabled by default) will override the final model dimensions for grids and block models such that there are at least 50 nodes in the x-direction and 50-nodes in the y-direction. This option was added because many novice users have been creating very coarse grids based on very few data points. Note: If the “Adjust Dimensions to Tidy Increments” option is enabled, the number of nodes in the x or y-direction may be less than 50. 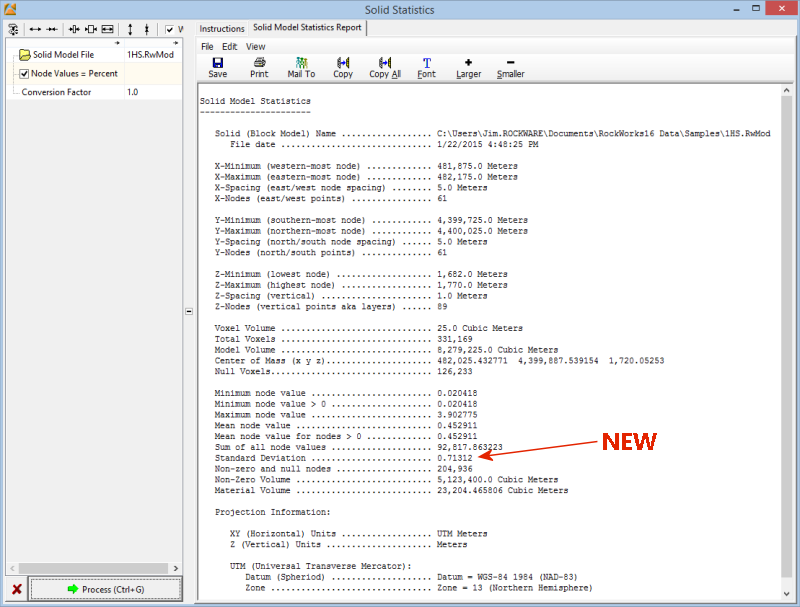 The maximum number of increments within the Utilities / Solid / Morph program has been increased from 10 to 100. This improvement provides a means to create more gradational transitions between models. To see an example, click on the link below. The High-Fidelity option within the solid modeling now works correctly. Windows 64-bit: Increased from 2 gigabytes to 4 gigabytes. If this variable is set to 1, then PAE has been enabled. If this variable is set to 0, then PAE has not been enabled. You will need to use the Windows Registry Editor to change it accordingly and then restart Windows. An additional benefit is that other programs may also benefit from the additional, addressable memory. This increase in addressable memory space means that the likelihood of RockWorks generating “out of memory” errors will decrease in a variety of applications. A memory “leak” has been removed from the RockPlot3D program. A memory “leak” has been removed from the Utilities / Grid / Math / Resample program. The RockPlot3D / File / Animations / Model Reveal program now includes an option for displaying the current slice coordinate within the upper-left corner of the video. This new capability provides a means to identify the location of features that are displayed within an animation. Click here to watch a video that demonstrates this new capability. The RockPlot3D / File / Animations / Model Reveal program can now create videos at higher resolutions without generating an out-of-memory error. Changes to the settings for output Volume, Mass and Area weren’t being updated until the program was restarted. This effected some Volumetrics reports. 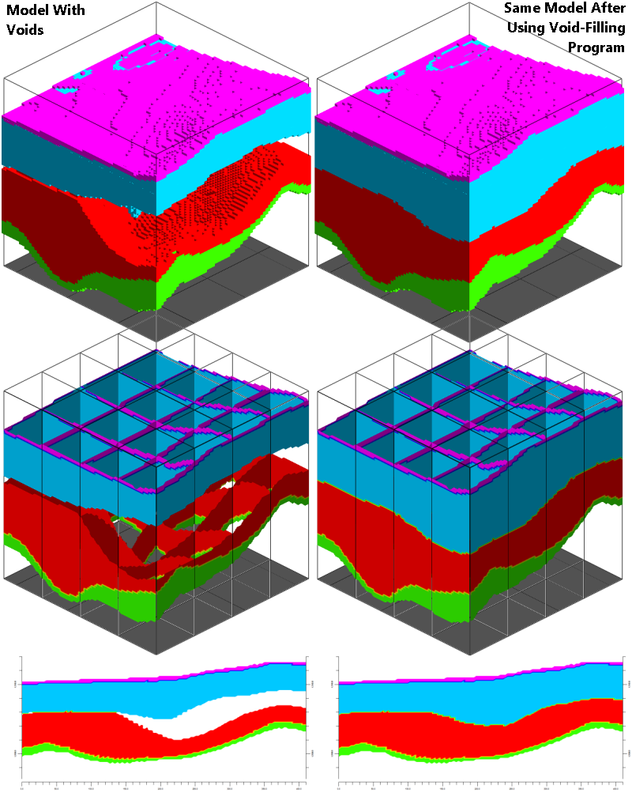 The RockPlot3D program now use the proper method for building a fence diagram when using a custom color table. 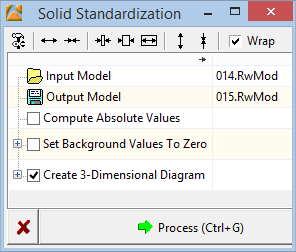 The Utilities / Grid / Grids -> Solid Model program now skips rows within the input datasheet that are disabled (i.e. the Enabled checkbox is unchecked). 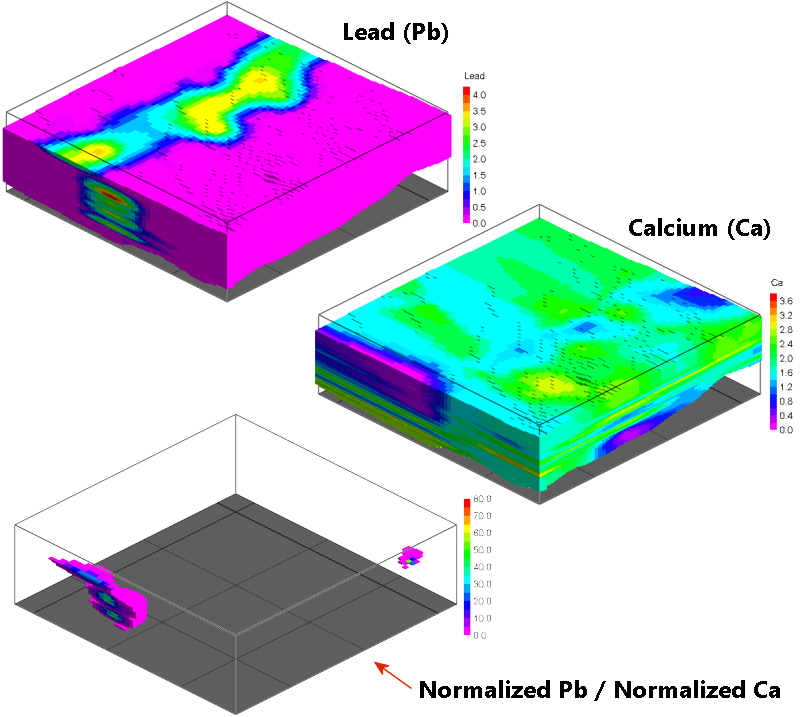 The Utilities / Solid / Statistics / Lithology XY Analysis program now provides options for removing the header line and changing the delimiter. The Borehole Manager / Stereonet From Fractures and Stereonet Map From Fractures programs have been hardwired to always use Dip and Dip-Direction as the data convention rather than using the convention set within the Utilities / Stereonet program. 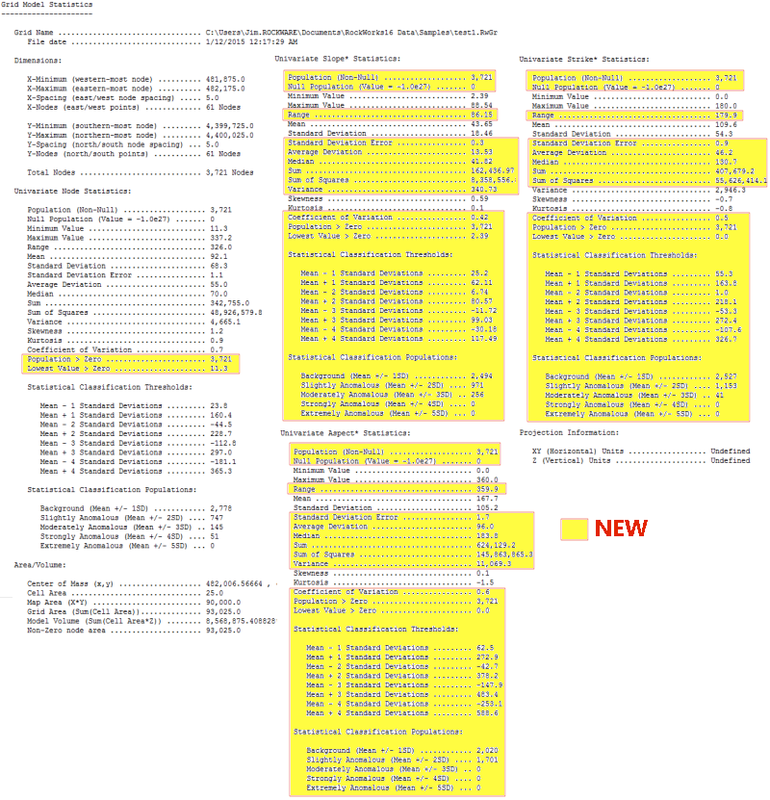 Very large and/or high-resolution print-outs from the ReportWorks program no longer omit portions of the output. When plotting Project Dimensions based on UTM coordinates within Google Earth, the perimeter is no longer sporadically shifted to a different UTM zone. The Parallel Profiles option no longer generates a new model or new grids every time it generates a profile (assuming that the Create New Model option is activated). Instead, the program now creates a single model before plotting the first profile and then uses that model for all subsequent profiles. 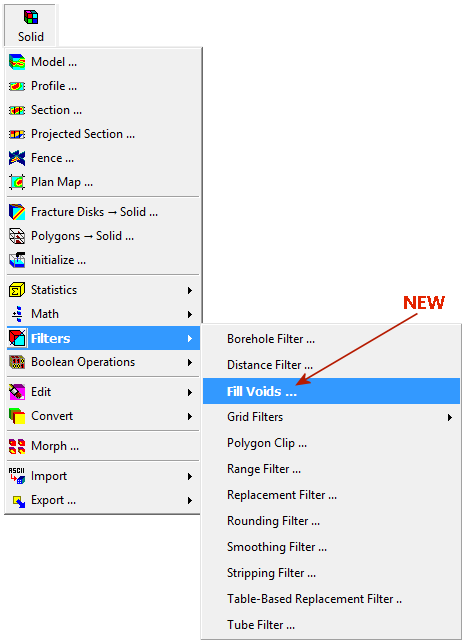 A new program titled “Fill Voids” has been added to the Utilities / Solid / Filters sub-menu. This program will replace undefined (null) nodes within a block model that are surrounded by defined nodes. Null nodes are defined as nodes that have a g-value of -1.0e27. The void-filling algorithm is based on the closest defined point. (035) It is now possible to include a caption (e.g. “Elevation – Meters”) for the vertical axes. Thes captions may be plotted at angles parallel or perpendicular to the axis. (036) It is now possible to include a caption (e.g. “Distance = Feet”) for the horizontal axes. 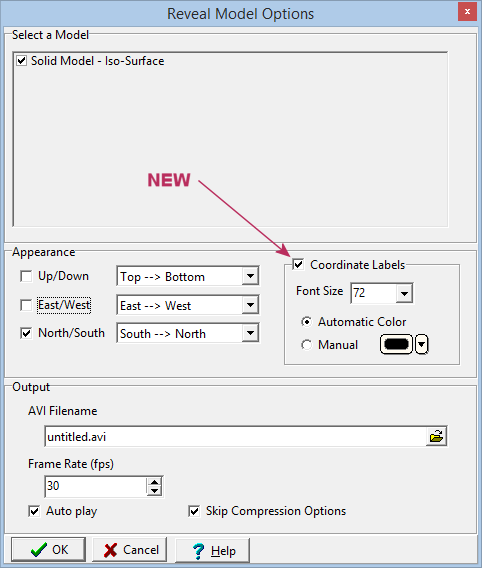 The grids that are specified within the Solid Modeling Options / Smoothing / Warped Smoothing sub-menu are now “remembered”, the next time the menu is displayed. The Utilities / Grid / Statistics / Report program now lists extended statistics for the slope, azimuth, and strike computations. 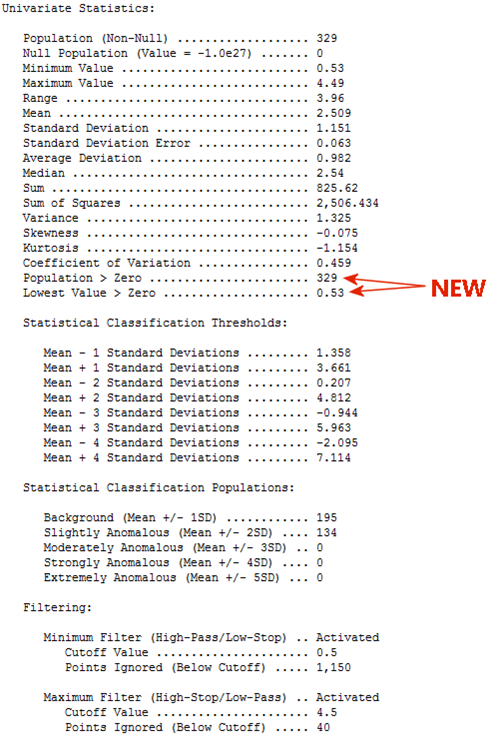 The univariate statistical reporting for the programs listed below now includes the population of points greater than zero and the lowest value greater than zero. The “Compute Standard Deviation” option has been removed from the Grid Statistics menu. Instead, this new version will always compute the Standard Deviation now that a faster standard-deviation computation has been implemented. 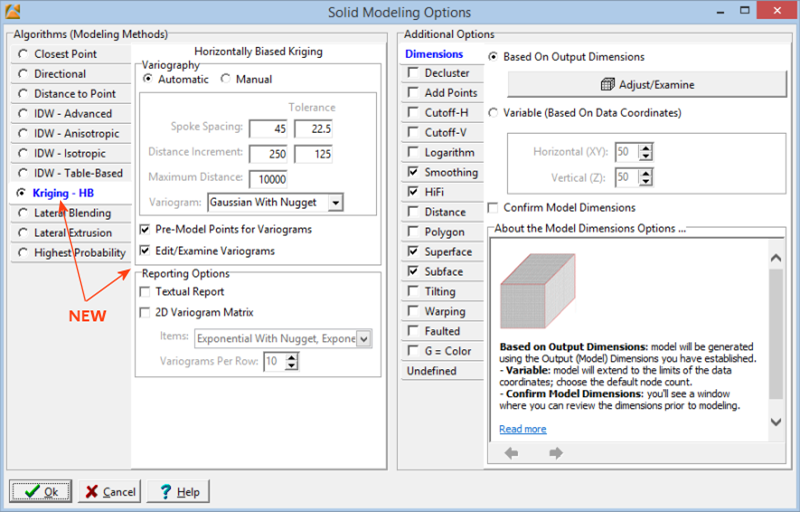 A new algorithm called “Horizontally Biased Kriging” has been added to the Solid Modeling Options menu. When creating the lags, distances between point pairs are based on the three-dimensional coordinates (xyz) of the control points. If the data is to be pre-modeled, the program will created a three-dimensional block model (solid) rather than a two-dimensional grid. The horizontally biased Kriging produces models that are better (but much slower to produce) than those created by the Anisotropic Inverse Distance Weigthing method. In the example sections show below, notice how the low values (dark blue) within the borehole logs are not as “overshadowed” by nearby higher values within the Kriged model wheres they are completely absent within the Anisitropic IDW model. 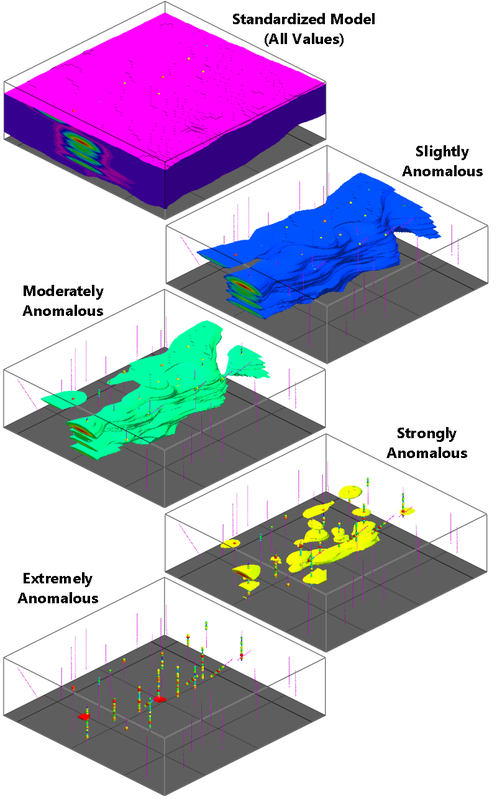 The Horizontally Biased Kriging algorithm is targeted at applications in which the geology is roughly sub-horizontal. For example, contaminants migrating though buried paleochannels would be a good application for this new algorithm. 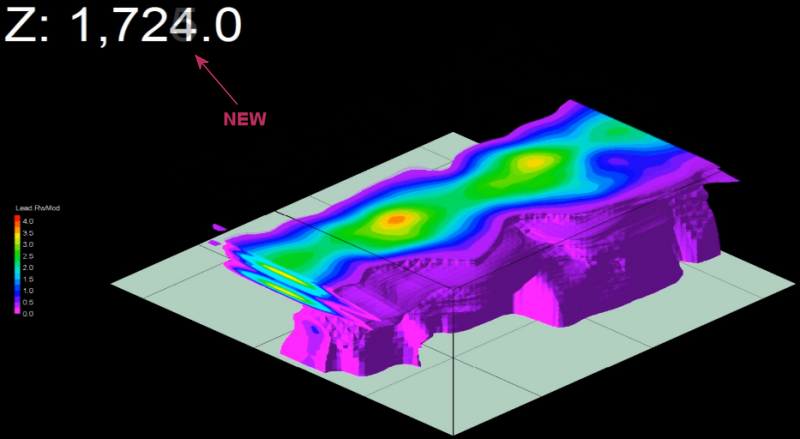 Conversely, modeling a complex, hydrothermally altered and fractured precious metal deposit would be better modeled with a higher-end product that provides for variography and Kriging in all directions and inclinations as well as performing separate geostatistics within polyhedral regions (e.g. fault blocks). 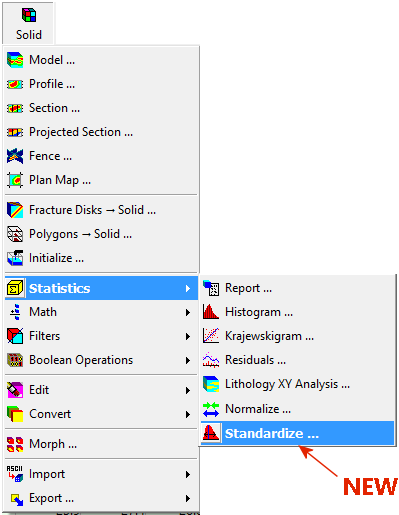 A new option titled “Standardize” has been added to the Utilities / Solid / Statistics sub-menu. Terminology: Slightly Anomalous > 1 (Mean +/- 1 Standard Deviation), Moderately Anomalous > 2 (Mean +/- 2 Standard Deviations), Strongly Anomalous > 3 (Mean +/- 3 Standard Deviations), Extremely (aka Outrageously, Insanely, X-Treme) Anomalous > 4 (Mean +/- 4 Standard Deviations). The Utilities / Solid / Statistics / Report program output now includes the Standard Deviation or the non-null g-values for the selected model. 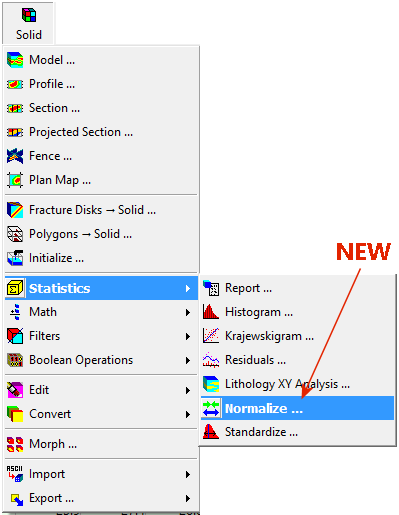 A new option titled “Normalize” has been added to the Utilities / Solid / Statistics sub-menu. 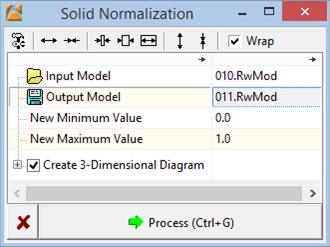 This program will convert all of the non-null node (g) values within a block (solid) model such that they range between two user-specified numbers. One type of application for this new program is comparing apples and oranges (e.g. looking for a spatial relationship between two types of geochemistry). By normalizing the two models to the same range (e.g. 1.0 and 2.0) and then dividing one by the other, we can see where they’re spatially related (i.e. the regions where the g-values are closest to 1.0). The Solid Modeling Options / Logarithmic option now works correctly. It was broken within the 1/21/15 upload. 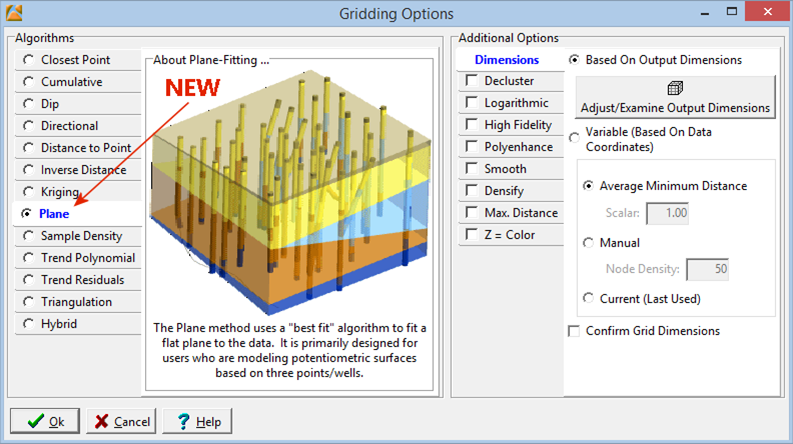 A new algorithm called “Plane” has been added to the Gridding Options menu. The Plane method uses a “best fit” algorithm to fit a flat plane to the data. It is primarily designed for users who are modeling potentiometric surfaces based on three points/wells.